Associated Press Yankees outfielder Giancarlo Stanton, left, celebrates with Didi Gregorius after Gregorius' two-run homer Monday in New York. 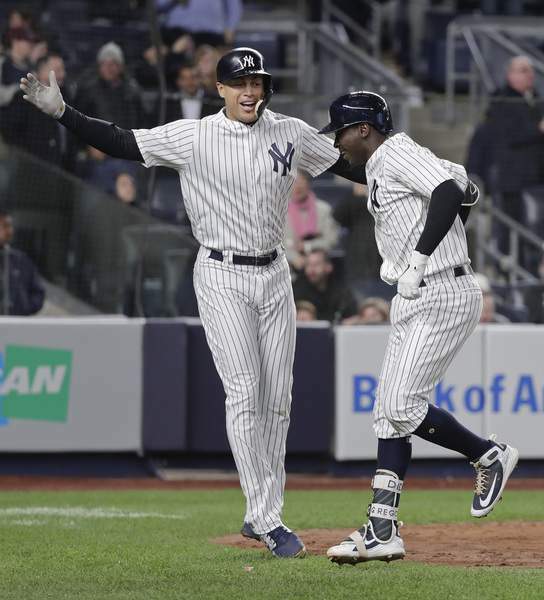 NEW YORK – Didi Gregorius homered twice for the second time this season, Gary Sanchez had three hits and three RBI, and the New York Yankees romped to a 12-1 victory over Derek Jeter's Miami Marlins on Monday night. About the only Yankees bopper who didn't get in on the fun was Giancarlo Stanton, who went hitless and got booed again by the hometown fans in his first game against his former team. Aaron Judge became the fastest major leaguer to hit 60 career homers, and Gregorius finished with three RBI. New York scored in each of the first five innings and built an 11-0 lead for Luis Severino (3-1), who gave up one hit in six scoreless innings and struck out eight. Judge hit his fourth home run this season and reached 60 in 197 games, five fewer than Mark McGwire. Jeter did not attend the game, the first between the teams since the former Yankees captain became Marlins CEO last October. Stanton went 0 for 3 with two strikeouts, a bases-loaded foulout, a walk and was hit by a pitch. The four-time All-Star, two-time NL home run champion and reigning NL MVP was dealt to the Yankees in December as part of a Jeter-directed payroll purge. Stanton's fifth-inning strikeout triggered scattered boos, and loud ones followed when he fanned on three pitches in the seventh — raising his strikeout total to 27 in 15 games. Stanton is hitting .210 with three homers and 10 RBI. Gregorius hit a two-run homer in the fourth and a solo drive in the seventh that hit ads behind the Yankees bullpen in right-center. His second multihomer game this season raised his home run total to five. Adam Warren and Chasen Shreve struggled, and Dellin Betances finished the five-hitter. After a pair of rainouts at Detroit last weekend, the Yankees moved back above .500 at 8-7. Beginning a nine-game trip, the last-place Marlins dropped to 4-12. Center fielder Cameron Maybin lost Sanchez's third-inning popup in the lights as it fell for a single, and right fielder JB Shuck got turned around in the sixth as Miguel Andujar's fly sailed over him for Andujar's second double.